John Mario, the principal tour conductor for Jackie Evancho's Songs of the Silver Screen Tour, has been noted for his exemplary affinity for accompaniment of singers thoughout the Classical and Pop world. His exciting 2012-2013 conducting schedule included appearances with the Atlanta Symphony, Colorado Symphony, Naples Philharmonic, Stockton Symphony, Dallas Pops, Baltimore Symphony, Rhode Island Philharmonic, Tacoma Symphony and also notably his Avery Fisher Hall and his Chicago Symphony Center debut. John Mario is also a veteran Opera Conductor. From the pit over the past decades, he has led dozens of productions in companies across the US. 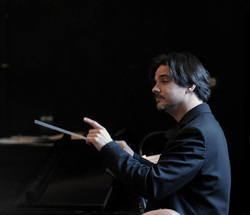 In addition to his conducting duties, John Mario performs in recital and is a leading coach of the Italian Opera repertoire in his New York City studio, preparing iternationally-acclaimed singers for their roles on the stages of the world. He has accompanied world renowned conductors and singers in opera rehearsal and has played in master classes for singing legends Licia Albanese and Renata Scotto. He has served as a judge for several major vocal competitions, including the Liederkranz International Opera Competition of NYC and the Belvedere International Opera Competition of Vienna. In 2012, John served as Italian Language Coach for NY City Opera's production of Mose' in Egitto.